The Bayfield Gazebo is crafted from a rust resistant steel frame in a black powder-coated finish and features a double-tiered roof as well as removable mosquito netting with zippers. 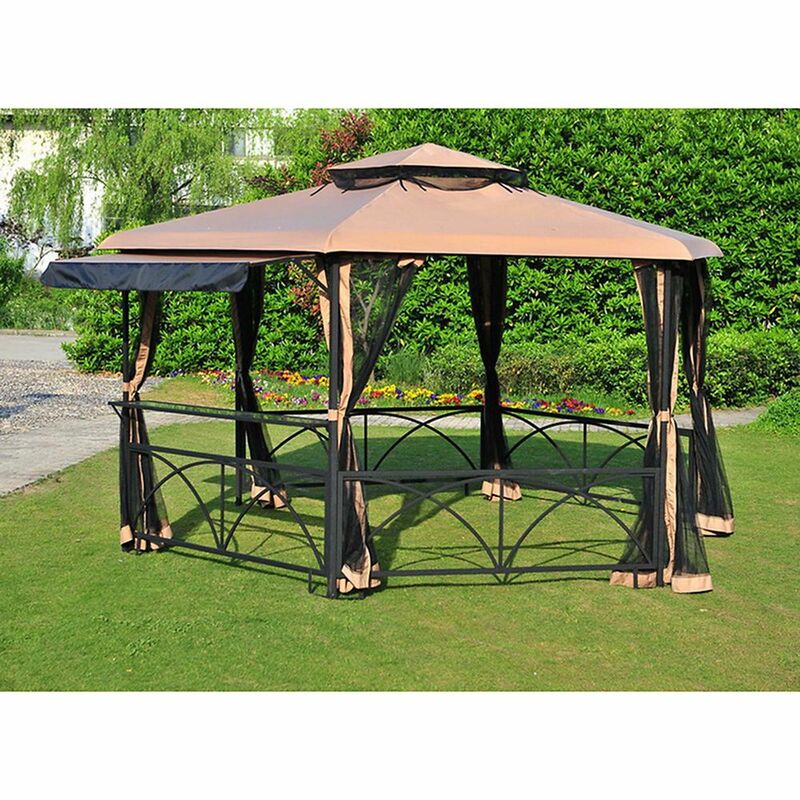 Bayfield Gazebo The Bayfield Gazebo is crafted from a rust resistant steel frame in a black powder-coated finish and features a double-tiered roof as well as removable mosquito netting with zippers. Bayfield Gazebo is rated 3.0 out of 5 by 2. Rated 5 out of 5 by nicknack8284 from Hampton Bay Bayfield Gazebo We saw the in store display of the gazebo and loved it's appearance; Once we brought it home my husband and I assembled it noting the excellent quality as well it included all the parts along with accessories...we have a 30' X 30' deck so this large gazebo fit nicely on it... we were thrilled with it and can't wait to beat my husband at a game of scrabble inside the gazebo!! Only negative thing is that instructions were confusing where we ended up relying on the diagrams and pictures given...maybe being made in China something was lost in the transalation? Rated 1 out of 5 by luv2garden from Disappointed I did not get to assemble the product since it arrived damaged. It uses frame rails that are about 1 in x 1 in. When I saw how small the rails are I had doubts of it standing on it own. They are so flimsy it did not stand up to shipping. The one side was completely dented. The frame is black not brown. Hi, we have this gazebo and is looking to replace the roof. Can you please let me know where i can find it. Hi Margaret, thanks for asking. For replacement part please feel free to contact our customer service hotline 1-866-578-6569 or visit us at www.sunjoyonline.com. Picture shows a hexagon, description says rectangle... Which is it? Hi, this unit is a Hexagon gazebo.